With the myriad of ports hitting the Switch I wanted to write a short list of pre-released 3rd party video games that I think would do well on Nintendo’s newest platform. I tried not going for big-name, highly profitable games as those I felt would be too obvious (with one exception). I also picked games that would port well to the Switch without facing a noticeable downgrade in quality. Now true, there have been a few recent games, like Doom, that ported reasonable well to the Switch but from what I understand the developers had to make a lot of cuts to make it work. I’m definitely no video game programmer so I’m avoiding games like Resident Evil 7 or God of War as those seem like a big challenge. Nonetheless, there are tons of other games that the Switch would love to have. Without further ado, let’s take a look! It’s been six years since Fez was released but the charm of that game still stands strong for me. Surprisingly, Fez hasn’t been ported yet to any Nintendo console so the Switch may be a great way to get some attention again. Customers’ strong indies support will easily boost Fez’s sales. The only issue is that Fez’s programmer, Phil Fish, left the video game world for several years now so seeing him (or in general Polytron, the developer behind Fez) come back just to make the game compatible with the Switch seems unlikely. Spike Chunsoft has a history developing games for Nintendo. Not even counting Pokémon Mystery Dungeon games, we also have the underground hit series “Zero Escape” who’s dark, and honestly mindfuck, story isn’t a far cry from Danganronpa. So the connection is clearly there we just need the idea to take hold! The original Danganronpa games were on the Playstation Vita games so I imagine it wouldn’t be difficult to move them over to the Switch as well. Packaging the whole trilogy would make the games more enticing for newcomers as well. And frankly giving a discount on the first two games would make me want to spend money on it again just so I can have some fun on the big screen. Okay, so I know I was trying to avoid big-name games but I couldn’t help but mention Fallout. Recently, Bethesda commented how pleased they were on the sales for their Switch games. This mainly includes their game-of-the-year quality games, Skyrim and Doom. If they could do a decent port of Doom, why not Fallout 3, New Vegas or even 4? I don’t know if I’ll buy Fallout NV again but I’d definitely put some money down for Fallout 4. The Switch flawlessly handled Breath of the Wild and Skyrim’s open world-system so I imagine it could manage Fallout’s world. Plus, the thought of seeing Pipboy on the Switch and Switch skins seems so hilarious to me. P5’s infatuation towards subways would transition well for playing it on an actual subway. I can imagine this to be a great on-the-move game as P5 is broken up by story events, battles, and side quests. True, you would (more than) likely get lost in the palaces if you stopped midway and picked it back up eight hours later but if that’s the port’s only fault, I’ll take it! What’s more, P5 was initially developed for the PS3 before transitioning over to the PS4. I bought the PS3 version and it runs pretty great! The load times are supposedly longer compared to the PS4 but I never felt they dragged on or were infuriating. Plus, Atlus already has a healthy relationship with Nintendo and even developed a Persona game, Persona Q, and its soon to be released sequel Q2, on the 3DS. Out of all the games on this list, P5 is the one most likely to happen. Why the hell does Nintendo not have any Katamari games? I’m still surprised by this just thinking about it. 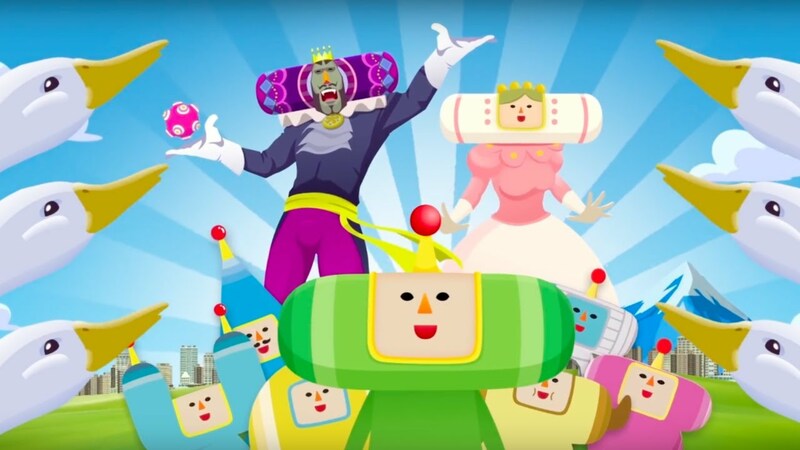 Katamari’s weird, offbeat humor would mesh well with Nintendo’s imagry. Namco could also go above and beyond their port by implementing motion controls. Perhaps you can give yourself a workout by moving your hands back and forth like our prince character. Or you could move just one Joycon forward, backward, and side-to-side to control the general direction of your katamari. Either way, I would be down to trying and playing it with motion controls. Katamari could also have a bonus level in the Mario Kingdom or Hyrule which would be hilarious! The thought of rolling up Gorons, Goombas, Koopas, and Octorocks would be a blast. This is a curveball but I believe a Journey-port would be a fantastic hit on the Switch. Not only has it been years since its first and second release on the PS3 and PS4 respectively but it’s a game that has held up extraordinarily well. The distant mountain you strive towards evokes a similar feeling when Link steps out of the Shrine of Resurrection and looks out to the huge, expansive world of Hyrule. And meeting a fresh new group of journeyers like you along the way would be so spine-tingling heartwarming and bittersweet. Journey is all about…well the journey. And to experience that once again on the Switch would be touching. This entry was posted in Video Games and tagged Danganronpa, Fallout, FEZ, Journey, Katamari, Nintendo Switch, Persona 5, Switch Ports on May 3, 2018 by Andy.